Alameda County is home to 414 public schools, including 113 high schools, 86 middle schools, and 255 elementary schools. 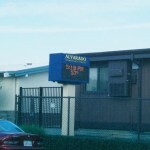 According to publicschoolreview.com, 223,449 students attend public schools in Alameda County, and 26,637 students attend private schools. School districts within Alameda County include Alameda Unified School District, Albany Unified School District, Berkeley Unified School District, Castro Valley Unified School District, Dublin Unified School District, Emery Unified School District, Fremont Unified School District, Hayward Unified School District, Livermore Valley Joint Unified School District, Mountain House Elementary School District, New Haven Unified School District, Newark Unified School District, Oakland Unified School District, Piedmont Unified School District, Pleasanton Unified School District, San Leandro Unified School District, San Lorenzo Unified School District, and Sunol Glen Unified School District. Estey Bomberger reviews and monitors news stories and reports of crime and lawsuits involving public and private schools nationwide. The following reports are for schools located in Alameda County, CA. If your child has been sexually abused or negligently supervised and you would like more information about your options or rights in a civil suit, contact us for a free consultation.